Time for a confession, dear reader, one that I hope will not cost me the “exalted” position of Nameless N00b_17: I am not a follower of the trve faith and, try as I might, cannot enjoy black metal. I know, I know, it’s all about the atmospherics, the stripped-back aggression, the chilling extremity… but, to be frank, I find myself unable to appreciate the, um, subtleties of Gorgoroth or Marduk. So it was with a certain sense of trepidation that I approached Mosaic I: L’Amour et L’Ardeur, the third album from Canada’s Unreqvited, and second this year1. They bill themselves as “depressive and uplifting” post-black metal, so I worried on a purely selfish level that I would have to dedicate time to an album I wouldn’t like and would have few insights to offer. The latter point might still be trve (judge for yourselves) but, as to the first, I needn’t have feared. 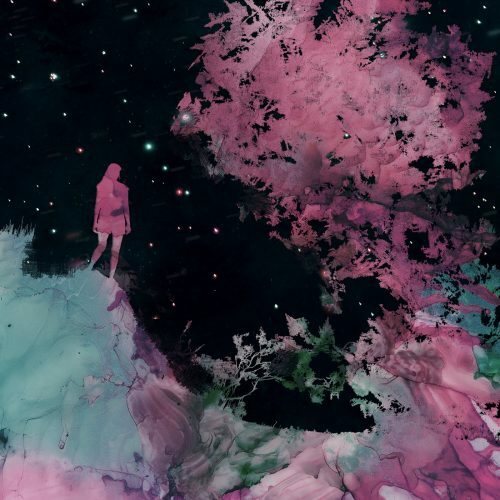 Unreqvited’s take on post-black metal on Mosaic I places all the emphasis on the ‘post-’. Indeed, for much of its forty-minute runtime, one might ask whether this qualifies as metal at all. And whilst that might be a legitimate question musically, this is unquestionably metal from an aesthetic point of view. This is, to quote the band, a “journey of massive peaks and bottomless caves,” which drew a genuine emotional reaction from me, lifting me in places before washing over me in cold waves in others. It offers delicate melodies, grandiose symphonic arrangements, some perfectly executed post-metal riffs and a sparing use of “DSBM”—I had to look this up: “depressive suicidal black metal”—vocals. I say vocals but this is perhaps misleading. Although there are voices—first introduced early into second track “Dreamscape,” I’m tempted to describe this album as instrumental. The vocals, when they appear, are either entirely wordless and genuinely harrowing howls, or angelic, but again wordless, chanting (see the latter stages of “Radiant”). They rise and fall with the music but are on a level, in dynamic terms, with the guitars and other instruments, feeling less like vocals than part of the soundscape, another instrument at Unreqvited’s disposal. Album opener “Sunrise” sets the scene, beginning with the sounds of running water and birdsong, before a piano comes in. From there, it rises—this is the only word for it—very much as its title suggests it ought to, introducing guitars and other strings, as well as synthesizers. “Dreamscape,” Mosaic I’s “heaviest” track—bar the closing stages of thirteen-minute epic “Permanence”—serves up a big post-metal riff and melodic lead worthy of Isis in their Oceanic or Panopticon heyday, but set to drums that are almost claustrophobic, pounding in your ears like rushing blood. As it progresses, the album draws on many influences beyond Isis, among which I number acts as diverse as Sólstafir, Gazpacho, Crippled Black Phoenix, the more majestic moments of Eneferens’ excellent The Bleakness of Our Constant, and even parts of Myrkur (see “Crown” or “Elleskudt,” for example), to name but a few. Yet this also manages to sound like little else. Each listen brought to light something new. Whilst undoubtedly building on the foundations laid by its predecessors, debut Disquiet and sophomore effort Stars Wept to the Sea, Mosaic I outdoes them at every turn, both as to complexity and ambition but also, crucially, restraint. It would be easy for the limited vocal range on display here, or some of the almost-but-not-quite blast beat drumming, to sound repetitive and over-used, but they never do. Instead, Mosaic I weaves delicate and expansive layers, conveying a real sense of pain and loss but also uplifting moments. It may be a relatively short album but it’s one ripe with emotion, from which you emerge breathless and gasping. If black metal, and by extension post-black metal, is about evoking slabs of atmosphere, there are none more trve than Unreqvited. With Mosaic I, they have delivered something special, which, if nameless n00bs had a say in such things (for the record, we most certainly do not), I would be advocating strongly for Record o’ the Month. And maybe more.